UMBC has begun the process of establishing an updated climate action plan, building on substantial success in decreasing the university’s carbon footprint over the past decade and a continued commitment to environmental stewardship. In 2007, President Freeman Hrabowski signed the American College and University Presidents’ Climate Commitment, pledging that UMBC would pursue carbon neutrality and serve as a leader in decreasing energy usage. In 2009, UMBC established its first climate action plan outlining specific goals, such as achieving carbon neutrality by 2075, initiating and completing an energy performance contract to achieve long-term energy savings, and increasing sustainability initiatives through a dedicated sustainability program. During the period of tremendous growth that would follow—growth in both UMBC enrollment and square footage of the main campus—UMBC actually cut emissions by 17 percent. Since UMBC joined the President’s Climate Commitment, all newly constructed campus buildings have been LEED certified, and facilities management staff have upgraded older buildings with more efficient lighting, heating, and cooling systems to decrease electricity use per square foot by 22 percent. UMBC now has more than 100 green campus features, including rain gardens, green roofs, and ponds of all sizes that offset paved areas, help restore local waterways, and support wildlife. UMBC has also implemented measures to support a reduction in emissions from transportation, such as incentivizing carpooling, getting Zipcars on campus, offering UMBC Transit services and establishing a bike share program. 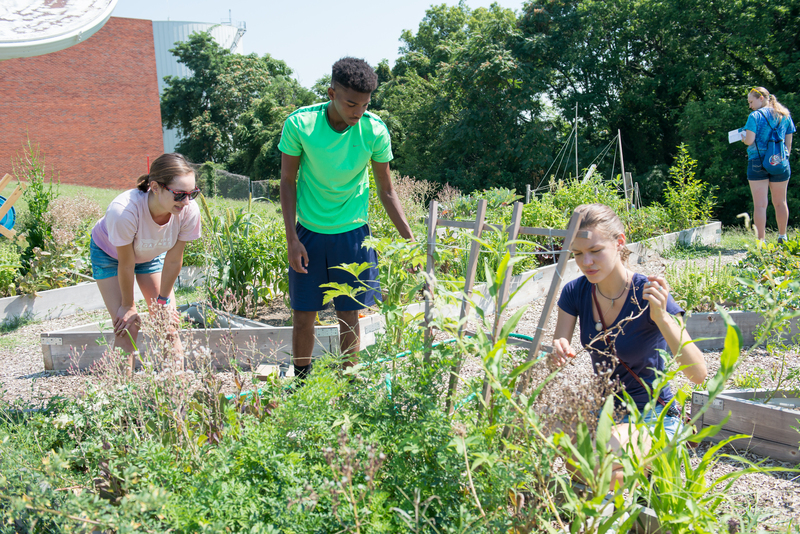 UMBC students work in the community garden on campus, one of UMBC’s many sustainability initiatives. To develop the updated plan, UMBC’s Climate Action Steering Committee is beginning with two campus-wide community gatherings on September 25 where members of the university community can share their ideas. Next, working groups will tackle specific aspects of the plan informed by lessons learned through implementing UMBC’s previous and current sustainability programs. Such initiatives include the Green Office Program for staff, Eco-Ambassadors for students, and the recently-formed Faculty Learning Community for faculty seeking ways to incorporate sustainability into their teaching and research. 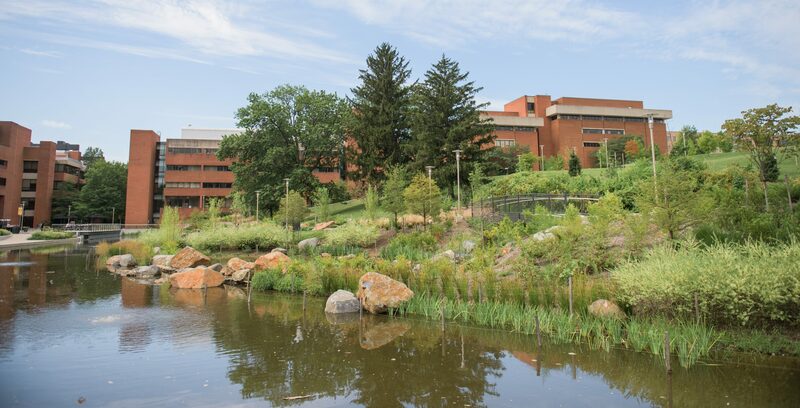 UMBC’s Library Pond helps manage storm water on campus and provides habitat for wildlife. Learn more about sustainability at UMBC at the Sustainability Matters website. Banner image: Eco-ambassador Toluwanimi Bello ’17, chemical engineering, and Tanvi Gadhia (right) on Patapsco Hall’s green roof.